Nothing says ‘Ladies’ Night’ quite like clinking glasses and a crisp bottle of Pinot Grigio. As four lifelong friends continue their tradition of gathering to gossip and discuss the latest read, one attempts to spice up their collectively drab lives by introducing a saucy trilogy to the table. ‘Book Club‘ is a playful commentary on having fun no matter your age or stage in life, and although this comedy is predictable and oozing with cheesy brie, it counteracts with uproariously endless humor from a top-notch cast. A slideshow of black and white photos (most of which are laughably doctored) and narration from Carol (Mary Steenburgen) introduce the four women and provide a small backstory behind their 40-year sisterhood. 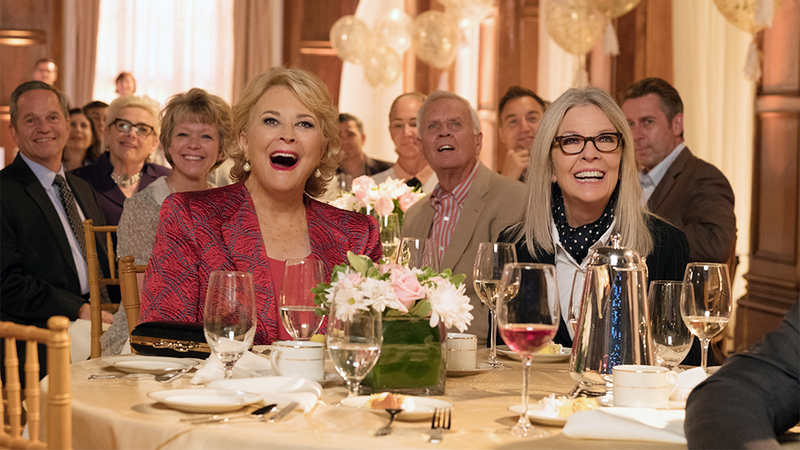 Despite being successful in most professional aspects, Sharon (Candice Bergen), Vivian (Jane Fonda), Carol and Diane (Diane Keaton) have all reached a slump when it comes to love. But once Vivian announces her selection of Fifty Shades of Grey as their next book, the women become inspired to introduce passion back into their lives by either rekindling old relationships or discovering new love interests. The plot-line might seem unsophisticated, but there’s actually more at play here. Romantic movies aren’t typically made for the older and more intelligent demographic, and that’s part of what makes ‘Book Club‘ stand out from ho-hum clichés. Unafraid to tap into the female psyche, the film dismisses society’s view of women having an expiration date. It sends a clear message that they still have the same feelings and desire to be adored as when they were young. And once you reach the heart of the picture, it proves itself to be canny, self-aware and also speaks to the comical trials of dating. There’s also a nostalgic peppering of actors that reunite throughout the film, including the return of Alicia Silverstone and Wallace Shawn, who worked together in ‘Clueless‘ (1995), and Andy Garcia with Diane Keaton, who both starred in ‘The Godfather‘ (1972). Even Oscar winner Richard Dreyfuss makes a memorable appearance as an online suitor for Sharon and owns one of the most hysterical scenes in the entire movie (let’s just say it involves spanx!) And in a twist of irony, the real-life daughter of Don Johnson, Dakota, starred in the film adaptation of ‘Fifty Shades of Grey‘ (2015). 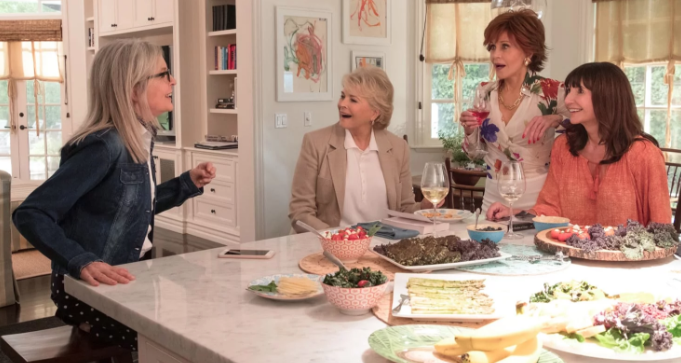 ‘Book Club‘ isn’t without its flaws and fluff, but Director Bill Holderman has put together a debut that puts both men and women on equal grounds in the quest for happiness. It has honest situations you’ll relate to and characters you’ll care about, and how often can that be said about a chick flick? Favorite Movie Scene of the Day #3! This entry was posted on Thursday, May 17th, 2018 at 6:35 pm	and is filed under Film, News. You can follow any responses to this entry through the RSS 2.0 feed. You can skip to the end and leave a response. Pinging is currently not allowed.